With the increase in technology, comes an increase in charging needs for a variety of devices. From cell phones to Alexa, to your favorite Bluetooth speaker, they all require the need to charge every so often. With careful planning, your home can have a thoughtful technology center without clutter and creating an eye sore. Interior outlet – include an outlet within your drawer to ensure a clutter-free counter-top. We really like this clean look, but it would be wise to have a surge-protected option for spaces that will primarily be used for electronics. 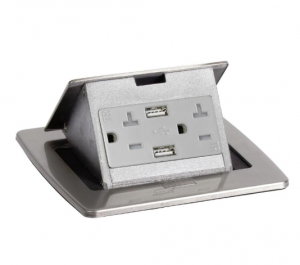 Pop-up outlet – these outlets can be hidden when not in use, but popped out as needed, leaving a clean, flush look. USB outlet or dedicated port – choose a dedicated spot for all of your devices that can be charged using both USB ports and pronged plugs. 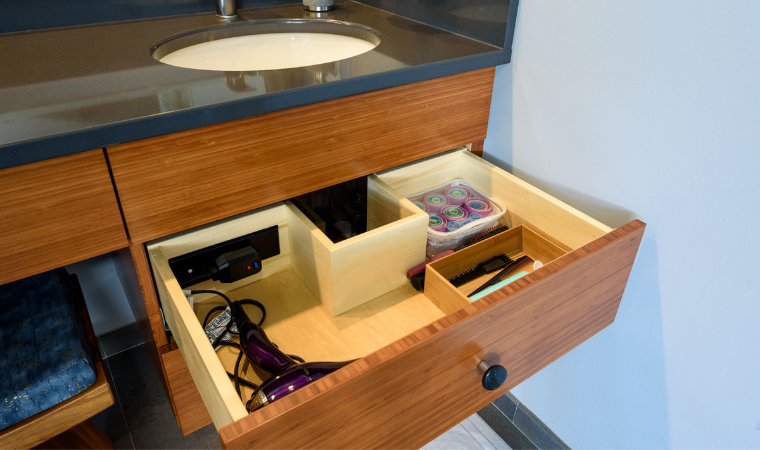 Tilt out drawers – typically dead space, a tilt-out can provide a great storage option without utilizing space you would otherwise need. Shallow cabinets and niches – like a medicine cabinet, a recessed cabinet can match the existing cabinetry, but exist in an area with limited space. 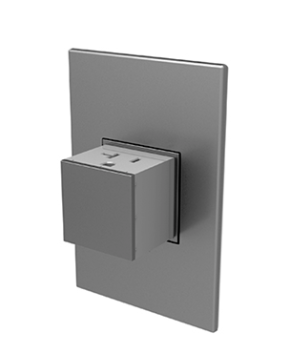 If you include an interior outlet, this cabinet can house a variety of tech items not visible unless desired. Whatever solution you desire, finding a charging solution for your tech toys is a good investment in a remodel.